David Cameron warned EU leaders to meet Britain’s demands, as he faced mounting pressure to outline his terms for keeping the UK in the EU. He is expected to set out these demands in greater detail on Tuesday. George Osborne began to set out what Britain sought from its renegotiations in a speech delivered to German business leaders at the BDI (Federation of German Industries) in Berlin on Tuesday 3 November. As the prelude to Britain’s EU referendum the renegotiations have gained in significance, particularly as the lead for ‘staying in’ has narrowed in the polls. With Britain’s referendum, the EU faces the possibility of a Brexit just month after it narrowly avoided a Grexit. It seems reasonable to expect that Europe would pay substantial attention to these renegotiations and the concessions Britain is demanding of other EU members for its continued membership. A useful way of studying the amount of attention paid to Britain’s demands, is by examining their EU-wide public visibility. The extent to which actors or issues relevant to one EU member are visible across the rest of the EU is sometimes described as horizontal Europeanization of national public spheres. Following this line of inquiry, we investigate the visibility of Osborne’s speech and the UK’s demands across Europe’s twitterspheres. Following the same methodology outlined in our previous post, we collected tweets matching a set of relevant keywords on Tuesday 3 November, covering the time of Osborne’s speech, through twitter’s streaming API. We used the Google Maps Geocoding API to map user-specified locations to countries. 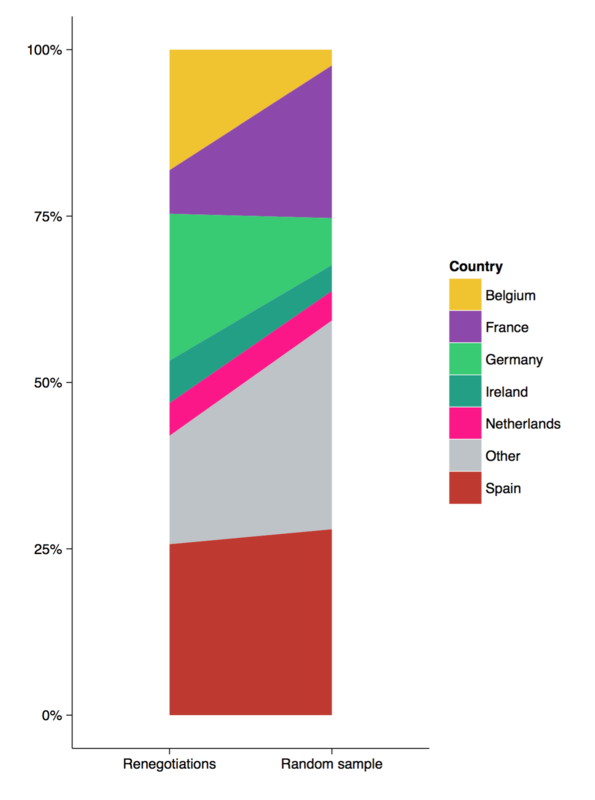 The data presented includes total volume of tweets by country. To get an idea of how many tweets from the UK and other EU countries we should expect in general, irrespective of the issue, we collected a random sample during a comparable timeframe from the streaming API’s sample endpoint. The cartograms (Figure 1) and stacked bar charts (Figure 2) contrast the UK’s share of tweets on the renegotiation with our random sample. The share of tweets concerning the renegotiation originating from UK based users account for nearly 81 per cent of tweets, as compared to 34 per cent in the random sample. 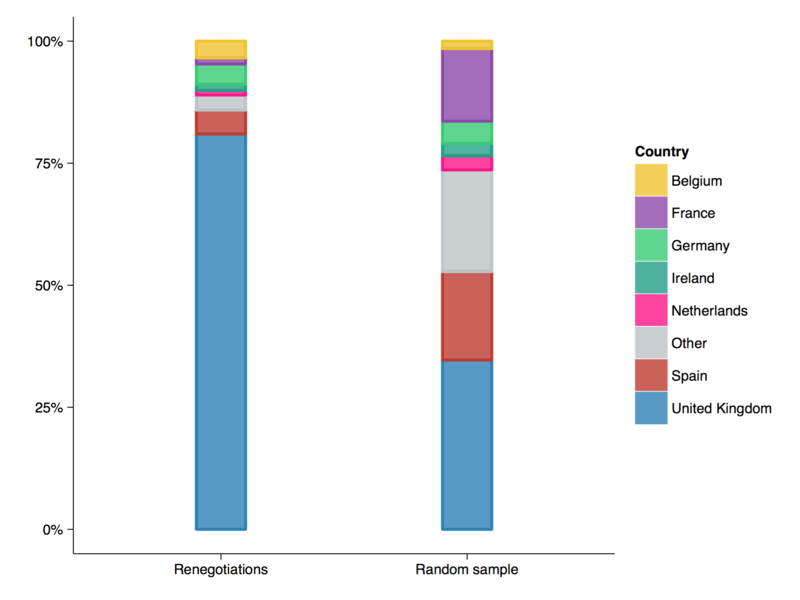 Consequently countries other than the UK have a lower share of renegotiation tweets compared with our random sample. This could be interpreted as reduced visibility of UK demands across European twitterspheres, though it is not necessarily an indicator of reduced visibility. This shift in share of total tweets could be driven by an increase in the amount of UK tweets rather than a reduction in tweets originating elsewhere in Europe (perhaps unsurprising given that the topic is intrinsically related to Britain). What is notable, however, is the change in relative visibility elsewhere in the EU. Europeanization is, after all, concerned with the extent to which an issue of significant importance to on EU country (Britain’s renegotiation with the EU) is visible in other EU countries. The bump chart (Figure 3) excludes UK tweets to trace how the share of tweets originating in other EU countries shift when comparing the renegotiation and random sample. Given that the renegotiations concern the whole of the EU (e.g. they concern demands Britain is making of other EU countries) we may expect more or less uniform visibility of Britain’s demands: that is, we would expect shares of renegotiation tweets to be similar to shares of tweets in the random sample (e.g. if there is a shift in share size this would indicate a lower or higher than expected visibility). Figure 3 illustrates that visibility (understood as share of tweets) is increased in Germany and Belgium (perhaps unsurprising given that Osborne’s speech was held in Germany, and that EU policy making is concentrated in Brussels), is roughly stable in Spain, Ireland and the Netherlands, and is reduced in France and other EU twitterspheres (possibly indicating a lack of interest in the British renegotiations). Therefore, the overall picture on the visibility of Britain’s renegotiation presently remains somewhat ambiguous. While the UK’s share of total tweets indicates that visibility elsewhere in Europe is possibly lower than one may expect, the bump chart suggests that the renegotiations may not be quite as invisible in other European twitterspheres after all (though it does indicate reduced visibility in the French and other twitterspheres). Admittedly, setting out Britain’s demands at the Federation of German Industries did not make for the most high-profile venue. Nevertheless, given the critical role the British government assigns to these renegotiations in determining Britain’s future in the EU, and the irrevocability of an important member state exiting the EU, it is surprising that the evidence on EU-wide visibility of Britain’s demands does not paint a more decisive picture. We will continue to trace Britain’s EU renegotiations across Europe’s twittersphere to see whether clearer evidence of Europeanization begins to emerge. Max Hänska is a Lecturer at De Montfort University, an associate at LSE IDEAS, and the lead investigator on the Euro Crisis in the Press project. This entry was posted in Europe, Max Hänska, United Kingdom and tagged Brexit, European Public Sphere, Europeanization, twittersphere, UK. Bookmark the permalink.